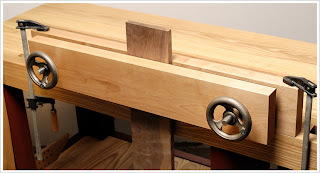 Last year Christopher Schwarz resurrected Joseph Moxon’s double-screw vise described in Moxon's 17th c. book “The Art of Joinery.” He covered it at his blog at Popular Woodworking Magazine and later published an article in the magazine itself. The vise took off and woodworkers started building Moxon vises left and right. But not long after the article came out we began hearing from people moaning about wood threading kits, their tricky setup and the tendency for wood screws to swell tight in their holes, and asking what we were going to do about it. Then our wheels started turning, so to speak. After a bunch of prototypes (I won't share the first version, it was a mutt of a vise) we hit on something that works great, looks cool, and is fun to use, whether you're clamping wood or not. And its fast. Here's what makes our Moxon unique. We like vises to focus all their potential power and precision on actually holding your work. That makes workholding easy. So like our Glide and Tail Vise, which are not weighed down by their own mass, the Benchcrafted Moxon works on a similar principle. The screws on the Moxon do not move. Instead, the precision rolled acme screws are bolted to the fixed jaw and we've tapped the cast iron handwheels for the 3/4" diameter acme screws (a time-consuming and labor intensive process.) Since the screws do not rotate inside the movable jaw, there is no friction to slow the operation of the vise. If you like how our Glide Leg Vise works, you're going to love the Moxon. Spin the wheel and start working. You don't need to adjust both wheels to hold work. Set one, then use the other to open and close the vise. The suede-lined jaw completes the tenacious grip. 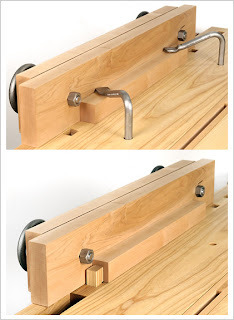 The Moxon vise can be attached to your bench with two F-clamps, between dogs (your dogs need to be spaced close to the front for this to work), or with two Gramercy (or other) holdfasts. We're offering Moxon vises both as complete vises (a little assembly required) or hardware only--everything but wood. With the latter, you can build several sizes, or different vise configurations, like a benchtop bench. We're so excited about this new vise that we're offering our first run immediately, which we expect to go quick. The first run vises will start shipping August 15. After the first run is out, we'll immediately begin another run. You can place an order anytime. 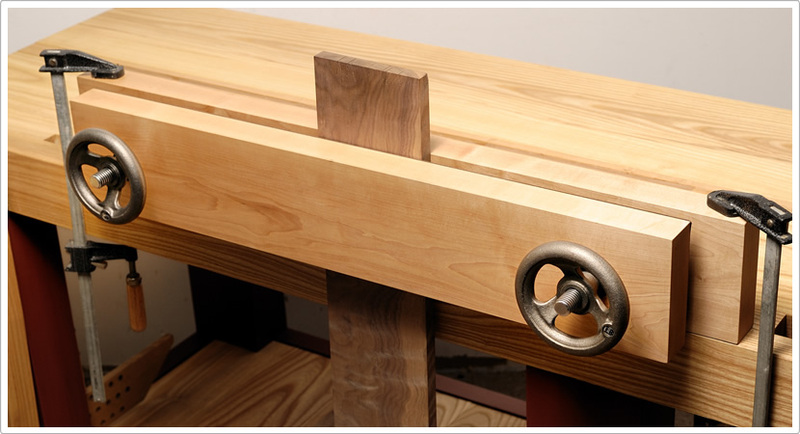 For more info, visit the Benchcrafted Moxon Vise page. You can also download complete Moxon Vise plans and instructions, for free, from our downloads page. Man that is some sweet action.. I'm sure I'll break down and order it by the time christmas rolls around. Jameel, these screws look a little short to use this hardware as a twin screw vise (like on a Holtzapffel bench), but one can only assume that's what's coming next? Seems like a natural progression after watching the video..
Matt, That's an idea that's been kicking around here for some time. When we can do it to our satisfaction, will we let you know. We've had some requests for longer screws, and we're exploring that option right now. If we decide to offer them, we'll announce it here on the blog. The Moxon Hardwarey arrived a little early, yesterday actually (thanks to USPS saturday deliveries). I have my vise 90% done. I have to glue the 2X2 and the leather. I found a 1-1/4" forstner to excavate the mortise for the nut a perfect size. I choped and paired the corners that I traced prior to drilling and a perfect octogon mortise was th resutls. I thought this might help others. Why Build The Shaker Bench?